Binoculars are the most versatile optical gadgets that allow users to zoom in at objects hundreds of yards away. Qualities vary between brands and there are a lot of optics manufacturers that own the market with the high quality and the convenience of their products. But, when you link binoculars to boating, you will need some creative innovation to eliminate vibration coming from the engine and the wind and from the rough conditions of the sea. For this reason, there is a technology called image stabilization which is used in numerous binoculars nowadays. In this article, I will be happy to introduce you to this outstanding solution for those who struggle with getting a stable image at sea and, as usual, you will find a review of the best products in this league. But before we start talking about this image stabilizing thing and boating, let’s see what our recommended product looks like and what features it has that makes it stand out from the rest. 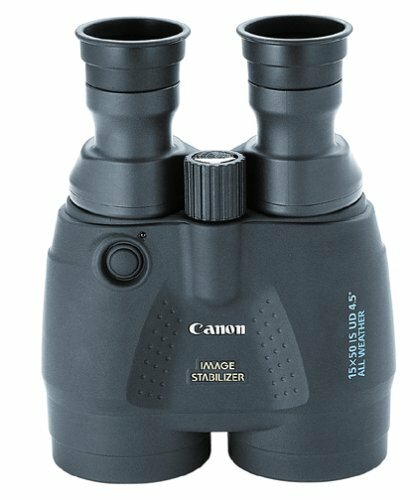 This product from the giant manufacturer – Canon – is one of the best binoculars equipped with an image stabilizer. With a high magnification power fixed at 15X, you will see detail that no non-stabilized bino could offer. The image stabilization system embedded in this binocular is a top-notch and will cut any vibration caused by the hands or the wind. It is like the new era of technology has come. It’s stunning to see how a binocular with such powerful magnification can make it possible to defeat natural circumstances and provide the user with a crisp clear image even on a boat. The large magnification factor is fortunately compensated by the large 50mm lenses. This is an important consideration when sailing: a marine binocular must be usable in dusk and dawn, not only in broad daylight. Though the whole thing is somewhat bulky, it is common for marine binoculars to be large since you are going to be using them within the confines of the vessel and won’t have to carry it around your neck all day long. Very powerful magnification power that also conserves high quality and guarantees brightness and clarity. The 50mm wide objective lenses provide a huge field of view and good low-light performance given the high magnification. The image stabilization system is very convenient for other activities too such as hunting, birding and stargazing. Multi-coated ultra-low dispersion lenses to enhance light transmission through the tube and get better resolution and more contrast. Single focusing knob at the center which is easily reachable and can be set quickly. Decent eye-relief for eyeglass wearers (15 mm). Commonly used at sea and the benefits of stabilization are quite evident. Users have noted that the material is not as durable as desired. Now, we can move to the important details, and talk about image stabilization and its great convenience in boating. Let’s see what it is all about! Why would one want a binocular for boating? Binoculars are commonly used among sailors and they are widely known to have huge benefits out on the sea. With their high magnification and exclusively the image stabilization technology they can do a great job out there in the open sea and have become a necessity on every boat. Whether you want to calculate the tide, look out for fish when offshore fishing, avoid a storm or have a more precise estimation of the coordinates of an object… an image stabilized binocular helps greatly in getting the needed results. What features to look for on an image stabilization (IS) binocular? 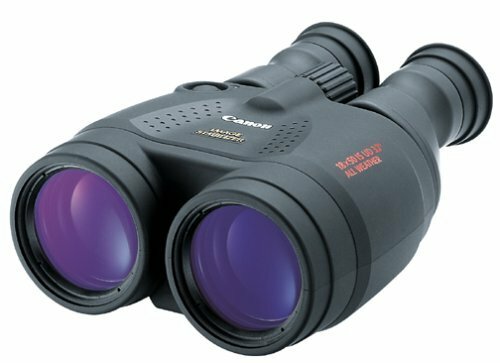 As any other binocular, there are some typical aspects that need to be taken care of to ensure decent performance. Magnification, field of view and objective lens size are the basics but the special feature here is of course the image stabilizer. Magnification power – for boating, you will need a high magnification to reach critical distances where you can appreciate the result and to make the product useful. The problem with normal binos this of course would cause a lot of shake making the optics unusable, for non-IS binos, you’re typically stuck with 7x or 8x max. The limit is much higher if you choose stabilized binos. Field of view – in a wide environment you will absolutely need a wide field of view to catch as many objects as possible and to make precise estimations. Therefore, the larger the FOV, the better, but it may be sacrificed for more magnification. Preferably, you will need a unique piece that can ensure both magnification and FOV. Objective lens size – the sea is known to have gray and foggy conditions, and for this reason, wide objective lenses are a necessity to let the most light pass inside and make viewing possible, especially at high ranges. With all these basic features found on a great binocular, we can now talk about the stabilizer and its importance in boating. As it is called, it is supposed to stabilize images to help get a nice vision in rough conditions and for this, it uses a combination of optical and electrical solutions. Well, how does that work? When you push the image stabilization button, a special block of lenses locked in the center of the tube is released and is ready to start reacting. The objective lens is equipped with gyro sensors that calculate the speed and angle of movement of the binocular then transmit it to a microcomputer located inside the binocular that analyses the information issued by the gyro sensors and create a solution. Once done, the microcomputer sends the command to the stabilization block of lenses and starts reacting counteracting the motion of the binocular. This series of instructions keeps repeating itself until the image stabilization button is released, in such a way that every moment becomes stabilized. To simplify: the binocular detects motion or vibration and tilts a special internal lens to compensate for the movement, making the image appear as if it’s not moving. Why is it good on a boat? The boat has a motor that produces vibrations at a high frequency, so they need to be dampened with the help of an image stabilizer in order to make the user appreciate the results. In addition to that, if a sailor wants to use high magnification binoculars, then due to the shaking of the hands, the image becomes blurry and also needs to be refined. The same goes for when you want to cut out the vibration of the wind. What things to be aware of? Size and weight – binoculars equipped with an image stabilizer usually have high quality optics and weigh more than traditional variants, therefore, carefully check the weight of your product and choose accordingly. The great thing about boating is that you don’t have to worry about dragging the thing around with you for a long time, you just pick it up, have a good look and set it down again. 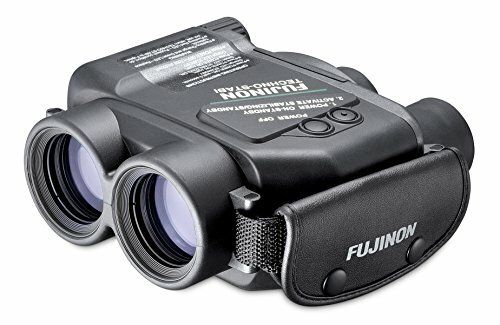 Build quality – such binoculars are expensive and contain extremely delicate optics in addition to an electric system that may not be resistant to shocks. Do not choose something that’s cheaply made, always aim for well-built products that guarantee more durability. 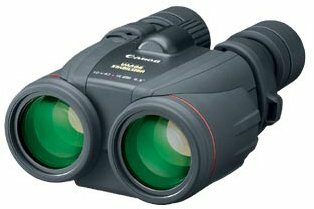 There are only a few manufacturers that produce high quality IS binoculars and they provide users with top-notch products. Let’s take a glance at what they have to offer! It is true that Fujinon is not as famous as Canon, but this Techno Stabi 14X40 competes with Canon image stabilized products and is preferred by many users. It has a 14X magnification power and 40mm wide objective lenses which is a nice combination for sailing and yachting as it provides a decent field of view and great clarity in rough weather. Back to Canon products, this company leads the market for these types of products (thanks to their know-how in making IS camera lenses). This one is significantly more compact than the recommended one above has some modest aspects but is still considered one of the best: 10X magnification and 42mm wide objective lens. It does not reach high ranges such as the 15X but it performs well under low light and provides a decent FOV. Depending on what you’re looking for, this out-of-the-box product is able to turn your boating experience into the best experience of your life. The 18X magnification is will give you amazing reach and is very useful for whale watching, shoreline viewing, shipspotting and other such marine activities where you want maximum detail. This product is carefully engineered for professional purposes. I don’t think you will regret having this awesome gadget in your gear case. Very high magnification that makes you reach almost everything between you and the horizon. With the favor of the image stabilizer that compensates the vibration. Super Spectra coating exclusively from Canon to reduce chromatic aberration and enhance contrast. 18X is kind of pushing what is actually useful and usable on a boat. The focus system is not the best, you will need patience before you get that sharp focus you want. The invention of image stabilization systems has made it really easy for users to get great optical performance from their optics. If you are fond of marine activities, do offshore fishing or sail often, getting an image stabilized binocular will greatly enhance your experience. Have a look at the products above, and do not forget to pay attention to the characteristics and good luck!